The leather portfolio for Jehovah’s Witnesses, also known as the Alexis Service Portfolio, is one of the company’s newest and most popular items. The portfolio has been designed for convenience, with enough room for the many items necessary for a successful day of service, yet compact and organized enough to be easily transported from one service location to the next. 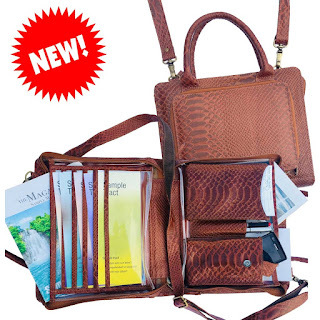 Made of authentic leather in various styles and colors, the Alexis Service Portfolio features pockets for cell phones and literature, an inner magazine pocket, a front zipper compartment that can be used to carry a variety of items. With flexibility in mind, the portfolio can be carried by shoulder strap or carrier handles. To purchase or learn more about the leather Alexis Service Portfolio, please visit Ministry Ideaz online at www.ministryideaz.com. Established in 2003, Ministry Ideaz designs and sells handcrafted items and other products designed to enhance an individual or family’s ministry and faith as Jehovah’s Witnesses. Ministry Ideaz offerings range from educational computer games for children to professional accessories.